When Payroll 2019 opens for the first time, click "File", "Open" and find the file "California.use". After opening, click "File", "Save" and save as the employee's full name. This will save you from having to entering the tax figures manually. Payroll 2019 uses METHOD B to calculate withholding amounts. This method will give an exact amount of tax to withhold. To use this method, you must enter the payroll period, filing status, number of withholding allowances, standard deduction, and exemption allowance credit amounts. These amounts are included in TABLES 1 through 5 of the EXACT CALCULATION Section. This sample reflects a Married status claiming 2 Standard Deductions and 0 Estimated Deduction that the employee would claim on a DE-4 form. If you use the Estimated Deduction, ADD it with the Standard Deduction and replace the Payroll 2019's $339 in the Withholding Allowance box with the total of the two deductions. Instructions for additional withholding allowances for estimated deductions: All additional allowances for ESTIMATED DEDUCTIONS that are claimed on a DE 4 must be used to reduce the amount of wages subject to withholding by using steps 1 and 2 shown below. If the Form W-4 is used for California withholding	purposes, all additional allowances for ESTIMATED DEDUCTIONS claimed must be treated as regular withholding allowances; unless the employee requests in writing that they be treated in accordance with the following: 1. 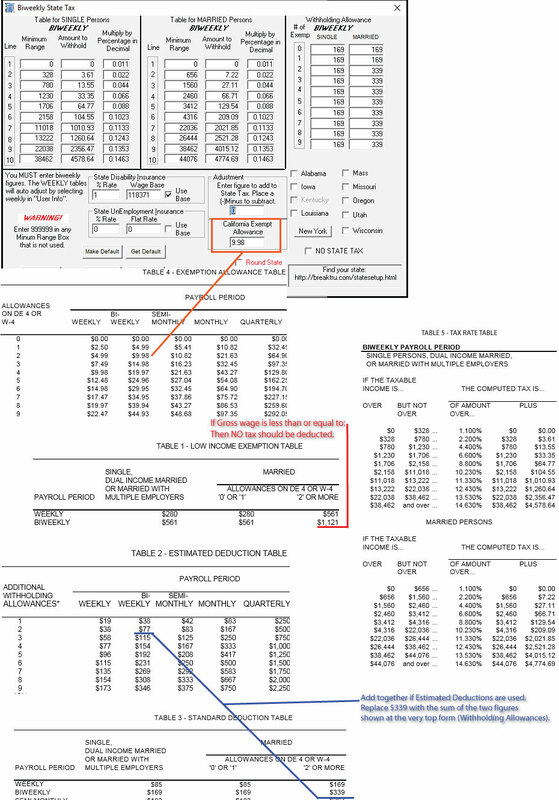 Subtract the employee’s estimated deduction allowance shown in the "TABLE 2 - ESTIMATED DEDUCTION TABLE" from the gross wages subject to withholding; and 2. Compute the tax to be withheld using: METHOD B - Exact Calculation Method If the DE 4 is used for California withholding purposes, compute the tax to be deducted and withheld based on the total number of regular withholding allowances claimed on line 1 of the DE 4. If the Form W-4 is used for California withholding purposes, compute the tax to be deducted and withheld based on the total number of withholding allowances claimed on line 1 of Form W-4; minus the number of additional allowances for estimated deductions claimed. If Form W-4 does not separately identify the number of additional allowances for estimated deductions, the employee’s request must specify the number claimed. The employee’s request will remain in effect until the employee terminates it by furnishing you a signed written notice or by furnishing you a DE 4. You may require employees to file a DE 4 when they wish to use additional allowances for estimated deductions to reduce the amount of wages subject to withholding. Enter your exemptions total in the appropriate column and line as shown in the Payroll 2019 form in the upper left of this page. Use these biweekly figures also for weekly pay frequency. Your weekly or biweekly pay frequency is selected in the User Info form. Enter the State Disability Insurance as shown.